This charming decorative tangle pattern, DeKore, was created by Kari Schultz of Twin Cities, Minnesota. This is Kari’s first pattern on TanglePatterns and her own drawing is used here with her permission. About me: I am self-taught and just started my Zentangle journey within the last year. I would love to get certified someday when my kids are a little older, so I can devote more time to it. (Actually I am new to drawing in general, but I can attest that Zentangle has helped me develop my general drawing skills too.) Oddly enough, I stumbled across the art of Zentangle through my fascination with crop circles which lead me to mandala art and sacred geometry, which eventually lead me to Zentangle®. I have to admit that I like how some of the designs I’ve created with “DeKore” remind of some of my favorite crop circles and mandala designs that I have drawn with a compass. What I love about DeKore though, is that I can create fairly symmetrical designs that seem to radiate from the center without relying on a compass or protractor. This provides the visual appeal of symmetry, and the relaxing component of repetition without being tethered to tools, erasers or being burdened with premeditated measurements. A little hint: It helps to draw your spokes from the center out and make sure you touch the edge of the adjoining spoke before you curl inwards. Give it a couple practice runs, and it will come fluently. Shading really adds dimension to this pattern, and adding spot color is stunning. 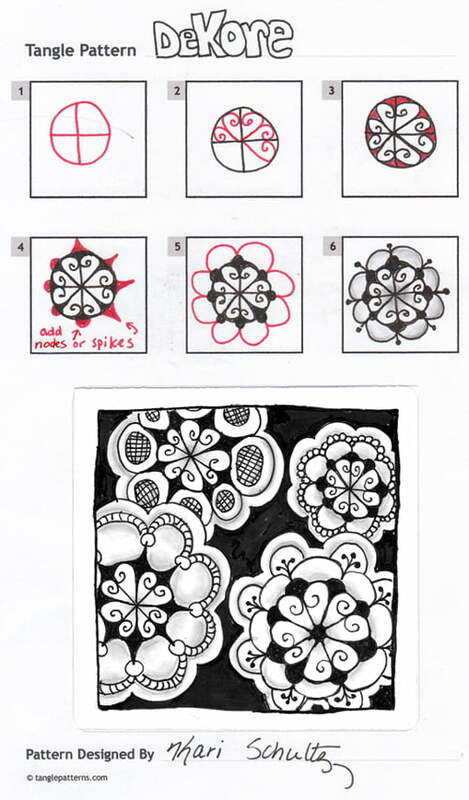 Here are Kari’s step-by-step instructions for drawing DeKore along with Kari’s Zentangle®, Convocation. Thanks for sharing a lovely new pattern, Kari! Check out the tag karis for more of Kari’s patterns on TanglePatterns.com. I will definitely be using this one – beautiful! Really love this and the versatility of it. Thanks for sharing it. This is such a pretty and delicate tangle. I will look forward to trying it out, so thank you for sharing this with us and all the details you kindly included too. I look forward to seeing more of your tangles, soon I hope. Ohhhh… I love this one! Wonderful tangle and a very informative write up. I’ll go play with this tonight! Merci! Love it, and all your narrative about how you decided to do it, and the names, etc. Keep up the great work and thanks for sharing! That is very nice. I like the pattern…. Simple and dramatic. Love this pattern! And I have the original drawings in my possession! 🙂 it is a great tangle, and I love the story behind it. I just found this tangle and I LOVE it! Very easy to do and it has so many wonderful tangellations that can be done It is beautiful. Thank you so much Kari! And I love the story that goes with it too.